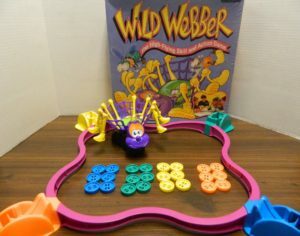 Originally created back in 1992, Wild Webber is one game in a long line of children’s/family games from the 1980s and 1990s that never really caught on. The 1980s and 1990s were ripe with these type of children’s games as Milton Bradley and Parker Brothers tried to find their next big hit. I am unsure how well Wild Webber sold but it couldn’t have sold that well as the game was never reprinted which is what happens for games that don’t sell well. Despite not being particularly popular I like trying out these children’s games that have been lost to time as they sometimes have some interesting mechanics that were before their time. Wild Webber is a fun family dexterity game that has some unique twists on the formula but doesn’t do enough to truly distinguish itself from the rest of the genre. Each player chooses a color and takes all of the bugs and the launcher of their color. Attach the web body to the back of the spider. Insert batteries into the bottom of the spider. Assemble the gameboard by attaching the guard rails between the launchers. 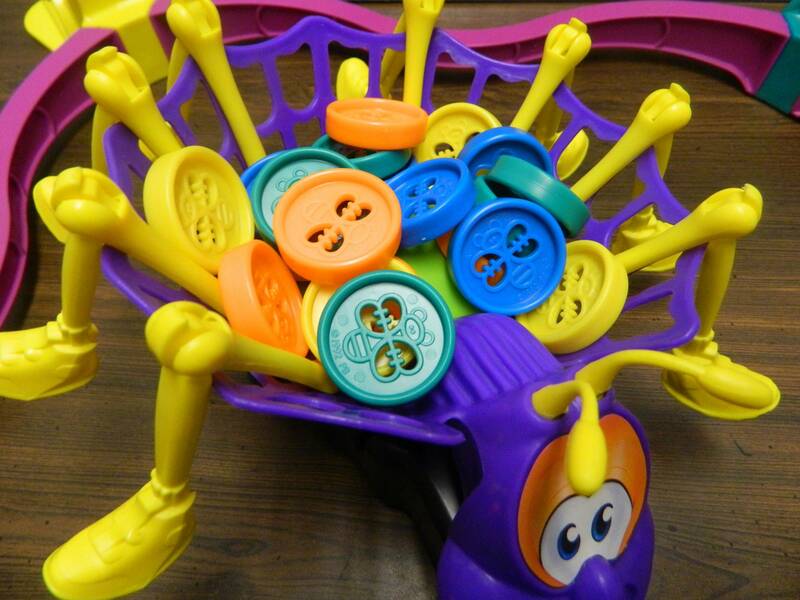 Each round/game begins with one of the players pressing the button on the back of the spider which activates the spider. The players count down “3, 2, 1, Webber” and the round begins. All of the players will play the game at the same time. Players load one bug into their launcher and pull back on the lever to shoot the bug at the spider. Players are trying to get their bugs onto the back of the spider. When a player misses the spider they can pick it up and shoot it again. The blue player has loaded their disc into their shooter so they are ready to shoot. When a player has gotten all six of their bugs into the spider’s web, they press the button on the back as quickly as possible to stop the spider. The first player to get all of their bugs in the net and turn off the spider wins the game. The orange player has gotten all six of their discs into the web. When they press the button to stop the spider they will win the game. Instead of playing the game with everyone playing at the same time, players can take turns shooting their bugs. Each player will shoot all six of their bugs before the next player shoots their bugs. Once everyone has shot all of their bugs, the player with the most bugs in the web wins the game. If there is a tie, the tied players take turns shooting until someone misses. The first player to miss loses. As I have already reviewed so many of these type of launching dexterity games in the past, I am not going to spend a lot of time talking about Wild Webber’s main mechanic. It is basically a very solid but unspectacular launching game. All of the players play at the same time and try to shoot all of their pieces onto the target before the other players. The first player to get all of their pieces onto the target first, wins. If you have ever played one of these type of games before you should know what to expect. While Wild Webber is far from a deep game, there is just something satisfying and fun about shooting your discs towards the spider. People who like these type of games should have fun with Wild Webber. Like with all of the other games from this genre, Wild Webber is quick and accessible to pretty much everyone. The rules are simple enough that I think you could explain the game to new players within a minute. Outside of the potential choking hazard for younger children, I really don’t see why the game has a recommended age of 6+. As long as they would avoid putting the pieces in their mouths, I don’t see why a kid under six couldn’t play the game. To go along with the game being simple to play, each game is also really short. Depending on how well the players shoot, I would say most games will take one to five minutes. As long as the spider is in a position where you can legitimately reach with your discs, it is pretty easy to get your disc to land in the web. I would say at least half of the game’s length comes from picking up the discs that you missed. The short length makes for a good filler game but Wild Webber is a little too short in my opinion. I think the game should have given players eight to ten discs as with only six the player who is given the best shooting opportunities will likely win the game. While Wild Webber is a fun game, it is not the type of game that you want to play for long stretches of time. I would say that most of the time you will only want to play it for 15-30 minutes before putting it away for another day. Probably the thing that distinguishes Wild Webber the most from all of the other launching games is the fact that the target is always moving. While some of these launching games have the target turn/tilt, I really haven’t seen any games where the target itself is constantly moving. This is both a good and bad thing for the game. On the positive side having a moving target adds some variety to the game. The moving target makes timing almost as important as aiming in Wild Webber. You need to time your shots properly so the spider is in a position where your disc can land in the web. Adding the timing mechanic along with applying the right amount of power adds some skill to Wild Webber. On the negative side the spider tends to get stuck in the corners way too often. It may have just been my copy of the game but the spider tends to head straight towards one of the corners and then can’t find a way out of the corner. The spider could occasionally navigate its way out of a corner but it usually just crashed into the same corner over and over again. Usually one of the players had to press it towards the center in order to get it moving again. Outside of it being boring for the spider to stay in one corner, it tends to give one of the players a pretty big advantage in the game. The player shooting from the opposite side of the board has a pretty big advantage since it is pretty easy to get your discs into the web when you have a straight shot with a large area that you can hit. If the spider stays stuck in the corner for quite a while, this player will likely win the game pretty easily. Meanwhile the other three players are going to have a much harder time getting discs in as they have no clear shot. I think the biggest problem that I had with Wild Webber is that for some reason the game gives you no way of aiming your shots with the launcher. Unlike a lot of these type of launching games, the launchers are fixed in place as they are used to form the pen that keeps the spider from wandering wherever it wants. While this is necessary for the game, it also leads to players having no way to aim. Outside of moving the whole gameboard, which is totally unfair for the rest of the players, you have to wait for the spider to be in line with your launcher or you are going to waste your shot. While the game would have had to change the design of the gameboard in order to add an aiming mechanic, I think it would have been worth it. Being able to aim your shots would have added quite a bit more skill to the game and it could have offset some of the problems with the spider getting stuck in the corners. Being able to aim your shots would have allowed players to shoot whenever they wanted instead of having to hope the spider would move in line with their launcher. Adding a moving target makes Wild Webber a little different than most launching games but it still suffers from the same flaw as the rest of the genre. Like so many other games Wild Webber suffers from the playing pieces flying all over the place. On the positive side most of the pieces tend to stay inside the gameboard which makes it easier for players to pick up their own pieces. The game still suffers from pieces flying off the table though. The players then have to either have players race around the table picking up their pieces that flew off the table, having players pick up other players’ pieces thus losing time they could be shooting their own pieces, or periodically calling time out where all of the discs on the floor are picked up before players can shoot another disc. Of the three options our group generally prefers the periodic time outs as it reduces some of the chaos of players running around the table trying to pick up pieces. While I can’t give Wild Webber anymore blame than any other launching game, I really wish one of the games from this genre could have found some way to address this issue. On the component front I would say the Wild Webber is kind of hit and miss. The spider mechanic is kind of cute and is quite sturdy. It has the problem of regularly getting stuck in corners though. 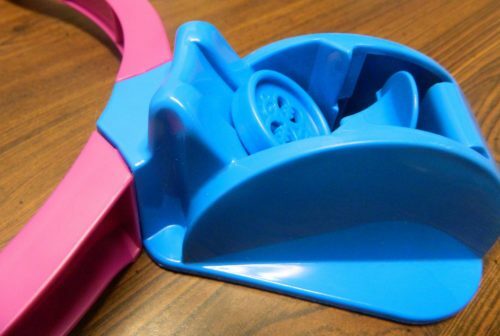 At times it also seems to be somewhat hard to turn the spider on and off by pressing the button on the back. Also like a lot of these type of games that feature an electronic component, it can also get quite noisy. The discs, gameboard and launchers are made of pretty durable plastic that should last as long as you aren’t really rough with them. Space conscious people may not love that Wild Webber is also one of those children’s games that come in a very large box. While the game wouldn’t have been able to fit into a small box, I think the box is larger than it needed to be. Should You Buy Wild Webber? 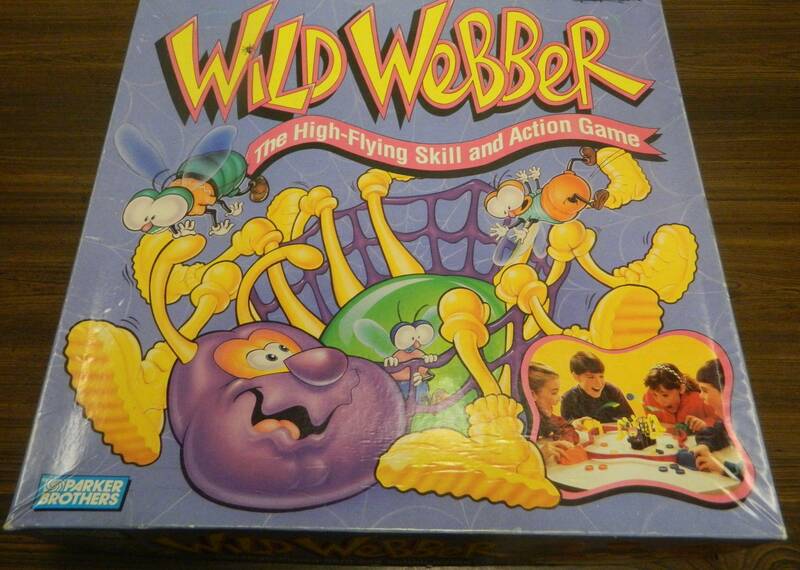 Wild Webber is a lot like many of the children/family dexterity games from the 1990s that never really caught on. For the most part it is very similar to a lot of the other launching games where you try to shoot your discs at a target. Like the other games in the genre it is fun even though it is a game that you only want to play for a little while before putting it away for another day. The one unique thing that Wild Webber adds is that the target moves on its own around the gameboard. This adds some fun to the game as you now have to hit a moving target. The problem is that the spider tends to get stuck in the corners way too often. The game also doesn’t allow players to really aim their discs which forces them to wait until the spider is in line with their launcher to shoot. Wild Webber also has the problem of every other launching game as players waste quite a bit of time having to pick up the discs that fall on the floor. If you have never really cared for launching games, Wild Webber is not unique enough to change your mind. If you like these type of launching games and like the idea of a moving target I think you can have some fun with Wild Webber. I would probably only recommend picking it up if you can get a good deal though as Wild Webber is not that original. Adding a moving target is an interesting addition to the launching genre. A fun quick little game that the whole family can enjoy. The spider tends to get stuck in corners too often. There is no way to aim your shots outside of deciding when and how much power to put into your shot.